Pink Butcher Paper - What Is It, How Do I Use It & Why All the Fuss? Home Knowledge and Know-How Pink Butcher Paper – What Is It, How Do I Use It & Why All the Fuss? Pink Butcher Paper – What Is It, How Do I Use It & Why All the Fuss? Trends and fads come and go. The ones that make sense stick around, like energy-efficient light bulbs. For some fads, we collectively decide they make zero sense, and they vanish as quickly as they appeared, like bell-bottom pants and wide-screen tube TVs. It can be difficult to predict which way a fad is going to go, but sometimes you see one that seems like a sure bet. Pink butcher paper looks like it fits into this category. It’s been a couple of years since pink butcher paper first appeared on the barbecue scene (of course it has been in butcher shops for as long as any of us can remember! ), and it seems to be continually picking up steam. So what’s the big deal with pink butcher paper, and why should you care? We’re going to explore these questions and more as we unwrap the mystery of barbecuing with butcher paper. What is Pink Butcher Paper? Why Is Pink Butcher Paper Popular with Grillers? When and How Do I Use Pink Butcher Paper? Where Can I Buy Pink Butcher Paper? If you’ve ever bought meat from a butcher or even the butcher’s counter at a grocery store, you’re familiar with the signature wrapping in which your cuts are packaged. This is pink butcher paper, though it is sometimes referred to as peach paper. Don’t mix this up with freezer paper, or even white butcher paper. They have very different properties. 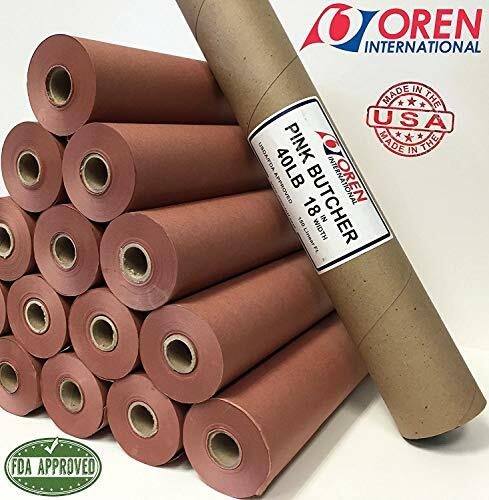 For one, pink butcher paper is pure and unbleached, unlike the white variety, while freezer paper has a plastic film on one side and is unsuited to subjection to high temperatures. True pink or peach butcher paper is made from virgin pulp, it’s FDA approved, and it’s 100% food grade. How does anything become a fad? Usually, it starts when someone famous is seen with it. In this case, you can pin it on Aaron Franklin, owner of Franklin Barbecue in Austin, Texas. In case you’re not familiar with it, it’s a legendary BBQ joint where people line up for hours to get a taste of what’s on the grill. People like Anthony Bourdain and Barack Obama sing the praises of the brisket, and Mr. Franklin has won basically every barbecue award there is. So, when he tries out a technique, people take notice. So, it’s no surprise that when folks noticed he was wrapping his brisket in pink butcher paper, the word spread. And that, dear readers, is how a fad is born. The most common reason why many pit-masters use paper is to hold moisture during the last stages of cooking. It can also help get past “the stall” when smoking meat, especially brisket. What is “the stall,” you ask? In a nutshell, it’s a point at which the internal temperature of a large piece of meat stops rising during a long, low ‘n’ slow session. Wrapping your meat late helps lock in the heat and moisture as the meat nears the end of the cook. The loose-fitting, loose-fibred paper allows the meat to breath better than foil does, which can be wrapped too tightly. Wrapping can speed up the cook time, too, so you’ll be enjoying your food sooner. While Texas crutch is great for pork ribs, it’s less effective on beef. Once you wrap something in foil, you’ve created a reflective, impermeable layer. That means no more smoke gets in, but, since heat cannot escape, cooking continues unabated. Though they look similar and have similar properties, there are clear distinctions between the two. Steak paper is commonly used for retail display. It’s thicker and heavier than butcher paper, and it’s meant to resist staining, and protect the meat from the air. It comes in several colors, each intended to allow easy identification of the type of meat inside (i.e., beef, pork, fish, etc.). If you try to smoke with steak paper, you won’t get the effect you’re after. The very properties that make it great for storage make it less than ideal for smoking. You can also use pink butcher paper after cooking to preserve the warmth and tenderness while the meat is waiting to be served. In fact, that’s what Mr. Franklin uses it for. Makes sense when you’re making brisket on a commercial scale, because it might be sitting there for a few minutes before it’s purchased. When it comes time to serve your beautiful barbecued meat, a bit of butcher paper makes for great presentation. Sending guests home with leftovers? Wrap it in paper! You can even shape it into cones for serving fries and wings. If dry brining is your thing (more on that here: Complete guide to dry brining), you can wrap your brining meat in the paper while it sits in the fridge. Cooking meat in a pouch with seasonings is a popular technique most often done with foil. You can do the same thing with butcher paper. Called “en papillote,” it’s a French (obviously) style of cooking, and it’s excellent for steaming delicate meat like fish and other seafood. Until very recently, this was a product used almost exclusively for commercial purposes. For that reason, it isn’t always easy to find. You might be able to get it at your local barbecue emporium, but you may need to order it from a wholesaler or manufacturer. Keep in mind; this stuff comes in whacking great rolls. In fact, you can order 1000’ rolls on Amazon that weigh more than 25 pounds. Unless you own a restaurant, or you’re papering the walls of your home, you do not need that much paper. There are other options available, in a variety of price ranges. Just be sure it’s approved for food use. That finishes our look at barbecuing with pink butcher paper. Feeling informed and inspired? It’s amazing that this cool technique has been hiding under our collective noses all this time. Makes you wonder what else there is you haven’t tried, doesn’t it? Of course, that’s part of the fun of barbecue – there’s always something new to discover! Browse through the articles on our site, and I’ll bet you’ll find at least a couple of things you’ve never tried, like unusual cuts of meat, international barbecue styles, or unique grilling techniques. If you enjoyed this article, please pass it along to your family and barbecue buddies. Now, if by chance you didn’t enjoy it, we want to hear about it! That goes for anything on the site. Send us your comments, corrections, and concerns, and we’ll do our best to address them. Same goes for any questions you might have about all things barbecue. We look forward to hearing from you, and to sharing more of our mutual love of grilling. Best of the barbecue to you! Can you use bakers parchment or baking sheets in the same way? Parchment paper is coated with silicon (not waxed) which makes it very grease proof and non-stick. This silicon layer would also prevent the parchment paper from ‘breathing’. Butcher paper is used for wrapping during a cook, because the traditional foil wrap Texas Crutch traps in ALL moisture, makes the bark go real soggy, and can end up with a pot-roasty finish. Not wrapping at all gives the best bark, does not push the cook through the stall, and overall loses more moisture from your meat. Pink butcher paper aims for a happy middle ground. It ‘breathes’ slightly, allowing some moisture out, keeping some of the bark intact, but still helps push through the stall and retains some extra moisture compared to not wrapping. Parchment paper, I feel, would result in a similar finish to foil wrapping, as the silicon layer would be highly impervious. I can’t state this as fact, it’s just my logical thinking on it. Might be worth googling ‘brisket cook wrapped in parchment paper’, there’s a ton of forum threads on it. I’m going to have a read of that myself in a short while.